You have a typo there: it's streitsüchtiger. "Disputatious" (which Shippey uses in RtME) might be better than "contentious": the German Wikipedia says that (Aristotelian) Disputation is "ein wissenschaftliches Streitgespräch". I think "less merciful" is right too. "Among all sciences there is none so proud, so noble or so contentious as philology - and to error none as merciless." 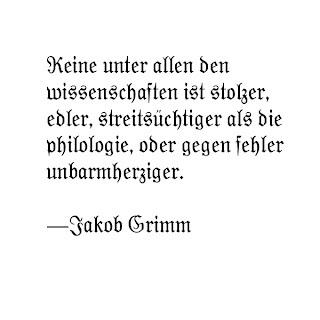 The "none" as John said is not archaic for Jakob Grimm - the "unter allen den" is an archaic formula. Modern German would use "unter den" or "unter allen" but the combination is typical high-brow German of the 19th century. I agree with you on your first translation...and Marcel, I love the way yours flows. "Among all the sciences there is none so proud, so noble (n)or so contentious as philology - and to error none less merciful." I like that one because we have the sensation of going up (so..so...so), then being dashed to the ground again with "less merciful." Would that be climax and antithesis? And it does have that more archaic feel. Michael, yours, however, is clean and elegant in its simplicity. Anyway, as to terminology, I have the impression that "Disputation" is the term used in Germany for the dissertation defense. So "contentious" would probably be the better fit here. Please correct me if I'm wrong on any of this. Since this is written in Fraktur, it should be written correctly. It makes no sense to use Fraktur with modern German "gemäßigte kleinschreibung" (moderate minusculization) or to employ the round _s_ everywhere. You should have long _s_ in the following words: Wissenschaftler (also _ch_ ligature), stolzer (also _st_ ligature), streitsüchtiger (also _st_ and _ch_ ligatures), besides writing Wissenschaftler, Philologie and Fehler with cap initials. [grouch on] Sorry, but if you do not do it this way you might as well use Comic Sans [grouch off].